Over the next few months a huge number of agencies and arms length bodies will move to GOV.UK and it’s our job to make sure all the old links to these sites continue to work. Sites like the Environment Agency and HMRC have millions of users who arrive via search engines, bookmarked pages and links from other websites. Every time there is a flood, the BBC links to the Environment Agency from its news pages, while hundreds, if not thousands of different money advice sites link to HMRC. We don’t just concentrate on the larger, well-known websites. Industry specialists and academic institutions rely on links to a multitude of sites to do their jobs, so it’s vital that all the old URLs continue to work after transition to GOV.UK. These URLs should either point at relevant new content on GOV.UK or link to The National Archives website if pages have been archived. Back in October 2012, Paul Downey described our strategy for redirecting websites and since then we have learnt much. One of the biggest lessons from moving the ministerial department sites was that we needed an easier way to manage redirects and archive links. As well as managing new content on GOV.UK, publishers need to be able to deal with legacy URLs. The Transition Tool gives people the ability to manage their own redirects and archive links rather than relying on GDS to make changes. Everyone whose sites have moved, or are going to move, will have access to the Transition Tool. People in departments whose sites have already moved to GOV.UK can request access by using the government contact form. For departments that are handling their own redirects, it’s possible to use the Transition Tool to manage these too. For agencies who are in the process of moving to GOV.UK, you should contact your transition manager to arrange access. We will publish a more detailed post about how to use the application soon. 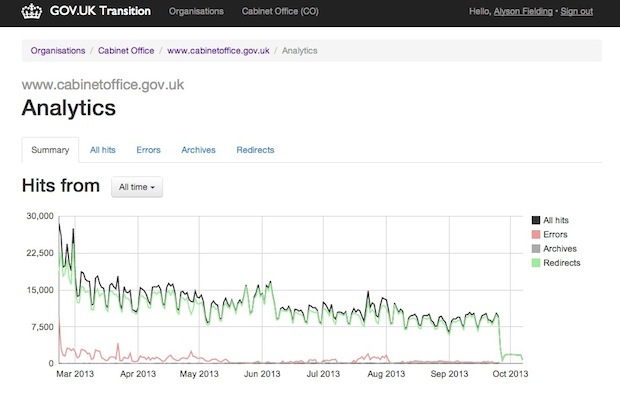 If you’re responsible for a medium or large website that’s moving to GOV.UK, your transition manager will probably have asked for your website server logs. This is a vital piece of the redirection jigsaw. We take your log files and process them to produce the full list of URLs for your old site that will need to map to GOV.UK or The National Archives. Log files are more reliable than analytics in identifying all the URLs people request on your sites, including requests for things like documents and other assets. They also show us traffic data so you can see the relative popularity of pages and make sure your highest traffic pages are all redirected to the right place on GOV.UK. After your site has transitioned, we process the traffic data from GOV.UK’s servers so we can see how the redirects are performing and we will see if people request any old URLs we might have missed. For smaller sites it’s not always possible to get log files, so the Transition Tool allows you to manually enter archive links or redirects. The initial list of URLs we create from your log files will point to the archived versions of your pages on The National Archive's website. All the organisations that are part of the current transition are going through a process to identify the user needs their organisations meet. As these needs are identified and agreed, new content is published on GOV.UK. 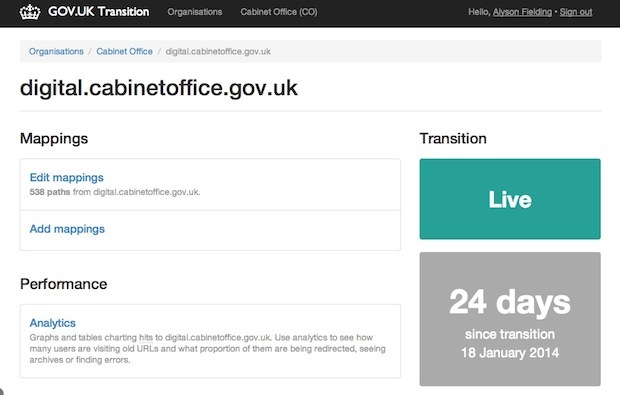 Once you have a new URL, you can redirect the old links that relate to these new GOV.UK pages in the Transition Tool. It’s possible to work on groups of URLs at the same time rather than working on links one-by-one. One of the most successful review tools we used for previous transitions was the side-by-side browser, designed to test all the mappings for the old Directgov site. We have updated it and it will be available to test all your mappings before the new pages go live on GOV.UK. The team has also crafted simple bookmarklet tools that let you test archive links and mappings. For these tools to work, you will need to create subdomains on your site that we can point to our servers, what we call ‘AKA domains’, which effectively mirror the traffic to your site. So we can start working on getting these set up, you should let your transition manager know who is responsible for managing DNS for your site. We will be publishing a series of more detailed posts to talk about all the technical elements of transition in the coming weeks but if you have any questions, let your transition manager know.